I have had the following piece published in the April/May edition of Red Pepper (buy now in all good bookshops and newsagents!). The piece focuses on the different visions of development that are emerging that result from conflicts around the impact of extractive industries on communities in Ecuador. 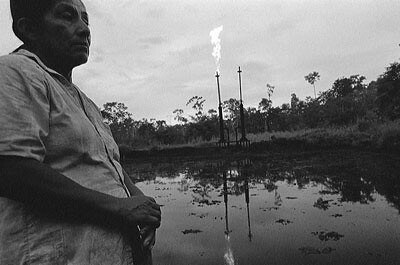 The piece has been published with some amazing although also disturbing photos taken by Kayana Szymczak of indigenous communities affected by contamination caused by Chevron Texaco and shown in a gallery "Crude Reflections" on Chevrontoxico.com. You can also see an article by some friends on a similar theme but with a much broader look at Venezuela and Bolivia as well on upsidedownworld. shorts, bargaining like marine stockbrokers for the boat’s catch. at least eight fishing boats and that several people had gone missing. The US, as in many Latin American countries, has a long history of presence and control in Ecuador – most obviously in the multinational companies that have dominated the country from the United Fruit Company to the petrol giants Occidental Petroleum and Chevron Texaco. In 2000, this influence was further entrenched under a Harvard-educated President Jamil Mahuad who not only dollarized the economy, but also agreed to US military presence in Manta and started moves towards negotiating a free trade treaty with the US. However just six years later, Ecuador is looking a much bleaker prospect for aspiring American imperialists. For the Andean nation has been yet another domino caught up in the red-pink tide that has swept through the continent. In Ecuador, this has taken the shape of the election of President Correa with his promise of a “citizen’s revolution” which boldly asserts the country’s sovereignty against external intervention. The Manta military base was one of his first targets, where he famously suggested that the contract for the base (due to run out in 2009) would only be renewed if the US agreed to give the Ecuadorians a military base in Miami in return. The US’s irritated silence suggests Danny may soon be back fishing in his old haunts. Mahuad proved to be both the peak and the beginning of the end for US-backed neoliberal ascendancy. In clear parallels with Bolivia and Venezuela, the rising social inequality and impoverishment that resulted from Washington Consensus policies eventually exploded onto the streets, with indigenous movements leading protests that overthrew two Presidents including Mahuad in 2000 and Bucarám in 1997. It accompanied a profound popular distrust for the corruption embedded in what was called the “partidocracia” (partyocracy) of Congress. Correa, who made his name for a series of populist measures in a brief four months as Finance Minister in 2005, was backed by left-wing academics and some social movement leaders to give voice to this popular frustration. He overcame the opposition of banana magnate Alvaro Noboa to win elections in December 2006. In a clever game of political brinkmanship, Correa who came to power rejecting any party support, then won a referendum by 82% that allowed him to dissolve Congress and to elect a Constituent Assembly to “re-found” the country. Symbolically, the assembly set-up to structurally change Ecuador and assert the country’s dignity is meeting just twenty minutes by bus from Manta in Montecristi, famous as the birthplace of General Alfaro, a nationalist President of Ecuador in the early 20th Century. It has the feeling of a paradigm still in the process of construction, but the same questions about models of development crop up in conversations with social movement leaders in Ecuador’s high altitude capital Quito. It seems that “desarrollista” (developmentalist) is increasingly joining the lexicon of words like neoliberal and transnational that should not be mentioned in polite left-wing company unless they are half-spat. There are also signs that the discourse is moving beyond rhetoric to policies. Acosta, before he became President of the Constituent Assembly, was briefly Minister of Energy under President Correa. He was instantly faced with a dilemma of whether to grant permission to the state petrol company to extract from one of the largest oil fields located in the national park of Yasuni, considered one of the most biodiverse regions in the planet and home to “uncontacted” indigenous communities. This new emphasis on what Acosta called “integrated development” derives partly from the fact that many recent popular struggles have focused on the environmental devastation caused by extractive industry. Not only are 30,000 indigenous people suing Chevron Texaco for environmental contamination, but there are also countless communities standing up against mining companies which with World Bank funding now have concessions that cover more than 20% of Ecuador’s territory. Communities have had no choice but to protest environmental contamination caused by leaching cyanide and mercury, unsustainably high levels of water use, as well as expropriation of agricultural land that has undermined their very livelihood. These same communities are now backing proposals for constitutional principles that would enshrine environmental and community rights against corporate greed. Questioning Ecuador’s development model also derives from the prominence of indigenous movements in Ecuador who have been at the forefront of the nation’s protests and who proudly espouse a different worldview. Efren Calapucha, takes time out one Saturday afternoon from his work preparing for the congress of the Ecuadorian Confederation of Indigenous Nationalities (CONAIE), to explain how the indigenous federation’s vision of development differs from a “western” model of development. “Development for us has always been about living how we always have lived. We have always looked for other ways to measure life rather than economic factors. We want to encourage people to think about different values: not to be competitive and individualist, but to learn how to care for mother earth, live in community, be embedded in family.” Efren, his narrow face etched with tiredness, says he misses his rural Amazonian community of Arajuno because of its different values to the ones he daily experiences in Quito. CONAIE is focusing its push for a different development model towards a demand for a “plurinational” state that would recognise indigenous peoples as nations with control over territory and rights to different cultural, social and political expression. “We are ready to mobilise to make this recognition a reality,” says Efren. Given CONAIE’s militant history in which they have frequently paralysed the country with blockades on issues from opposition to neoliberal agrarian reform to rejection of a free trade agreement with the US, it is clear this is no empty commitment. Behind the scenes lies the pressure on Correa of the major export sectors such as petrol, mining and shrimp companies as well as the reality of trying to create jobs and stem huge migration flows. Whilst unemployment has fallen slightly under Correa, underemployment is still growing. Meanwhile more than a quarter of Ecuador’s population has migrated abroad in particular in the last seven years– creating an economy highly dependent on foreign remittances. Extractive industries may create relatively few jobs, but it takes a brave politician to reject projects that promise income and economic growth.